This rich, fiery Asian inspired vegan noodle dish is packed full of wonderful spices and flavours. 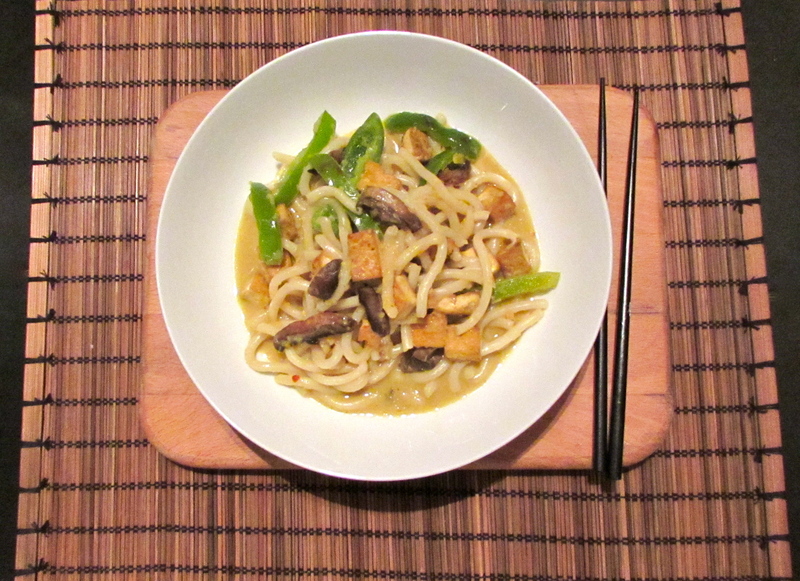 Thick, smooth udon noodles make for a hearty, filling base, the green pepper adds a nice crunch and vibrant colour, the portobello mushrooms bring an earthy, silky texture and the fried tofu soaks up the delicious spicy coconut broth really well. This dish is reminiscent of many of the flavours you’d expect at a restaurant like Wagamama, with the coconut and chilli and unusual noodles. It’s pretty quick and easy to make, so whip this up and you’ll be sure to impress your friends! Place the tofu on a large plate and balance a chopping board and heavy pan on top of it (or something else heavy that is likely to balance). Leave it for 15 minutes or so, to drain out the water. Meanwhile, make your curry paste. Place all of the curry paste ingredients – except for the sesame oil – into a deep-edged bowl and blend with a hand blender until it’s as smooth as you can get it. Add the sesame oil and then give it another go with the hand blender to make sure it doesn’t dry out. Stir it with a spoon to make sure you’re happy with the consistency; it should thick and a few little lumps are fine. To make your broth, place a large frying pan on to a medium heat. Add the curry paste and fry gently for 2-3 minutes, stirring frequently. While that’s simmering, cut your tofu into cubes, around 3-4cm. Using another frying pan or wok, add the sunflower oil and put it on a relatively high heat. Add the tofu and fry it until it’s golden brown, for around 7-10 minutes, turning it frequently. After 3 minutes, add the pepper and mushrooms and to the tofu pan and continue to turn them frequently with a fish slice or wooden spoon. Return to your pan of simmering broth and stir in the noodles. When the tofu has browned up and the pepper has softened, pour all of these ingredients into the pan of broth. Mix together well. Add the lime juice and cook on a low heat for 2-3 minutes. Serve in large bowls with a slice of lime on the side and eat with chopsticks. This dish is inspired by Simon Rimmer’s Malaysian-spiced noodles.